Helping people learn to program is an amazing experience. 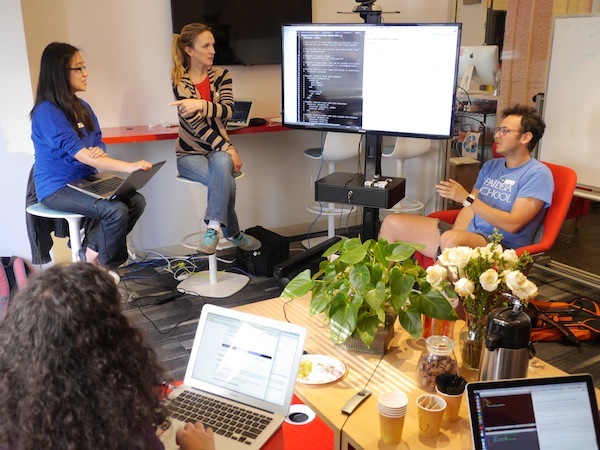 The most visible volunteer positions within RailsBridge are the workshop sponsors, organizers, teachers, and TAs. They make each workshop happen! Yay! Head over to the upcoming workshops page to see if one is coming up near you. If not, get in touch with your local chapter (or start one if it doesn't exist). Fantastic. Read through the organizing page and fill out our short interest form! Want to host or sponsor? That's awesome. Check out our information for hosts and Donor FAQ. So many other ways to help, too! There are tons of other things that have to happen to keep RailsBridge thriving. If you can help us with any of these things, fill out our quick volunteer interest form and we will be in touch. Help us improve Bridge Troll, our open source event management app. Students always wonder what to do next, and we'd like to build better tools for helping them figure out their next steps. We need to tell the world what we're doing! PR dabblers welcome! Blogging. Writers are the best. Tweeting, Facebooking, LinkedIn-ing: social media is fun. We're building an organization called Bridge Foundry to help us (and other orgs) manage our funds (and people) better!